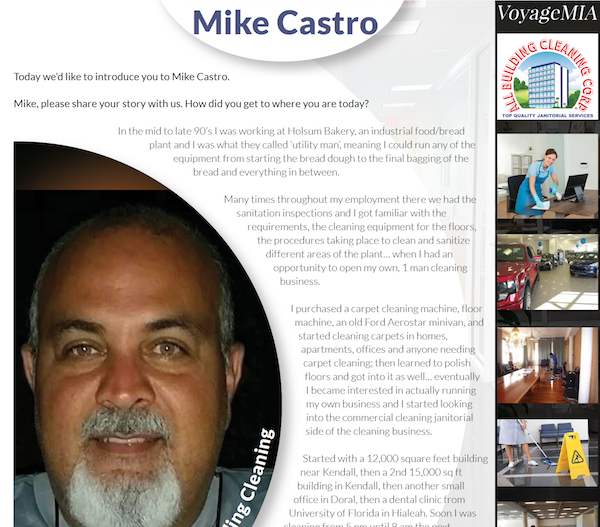 Mike Castro, owner of All Building Cleaning Corp in Miami, was recently featured in Voyage MIA’s, “Miami’s Most Inspiring Stories” in an up-close and personal interview. MIAMI, FL – February 19, 2018. VoyageMIA, a leading regional lifestyle publication in Miami, Florida, recently featured Mike Castro, owner of All Building Cleaning Corp in Miami’s Most Inspiring Stories for professionals and entrepreneurs. In the interview, he went on to say that, although it wasn’t a smooth journey, his company has steadily grown and now employs dozens of employees in the local community. Mike Castro, President of All Building Cleaning Corp., started the business in 1997 in Miami. Before starting the business he managed the janitorial and sanitation services division of Miami Holsum Bakery & Sparkle Clean Inc. His company, All Building Cleaning Corp is Miami’s choice for commercial and office cleaning services for office buildings, industrial, retail and medical. Communities served include: Miami Lakes, Hialeah, Miami Beach, North Miami Beach, Kendall, Coral Gables, Homestead, Ft. Lauderdale, Hollywood, Davie… and all throughout South Florida.